Do your interpersonal skills boost you forward or hold you back? Ever notice how some people have a knack for connecting with others? Not just "getting along" — but really making a connection. They can strike up a conversation with anyone, and easily smooth over the most difficult conflicts to reach a consensus. They communicate tactfully and leave a positive impression on everyone they meet. Their personal relationship skills improve their success — at work and in everything they do. Some people just naturally have these enviable skills. The great thing is, these vital skills can also be learned! Understand why different people act the way they do and handle all personality types with skill and ease. Learn to recognize the 4 behavior styles and gain strategies to communicate effectively with each. 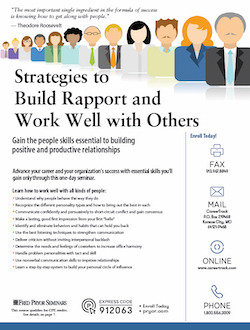 Communicate confidently, effectively and tactfully with all types of people. Sidestep conflict and promote cooperation among everyone on your team. Deliver criticism that is positively accepted, leading to meaningful change. Address differences diplomatically and quickly negotiate solutions. Solve issues with minimal disruption, so you can move on to productive collaboration. Eliminate self-sabotaging behaviors and build your circle of influence. Learn techniques you can use to build professional friendships and promote your ideas. Repair your image and replace it with a lasting positive impression. Don't let your relationship skills hold you back. Enjoy the career success you want and deserve. It begins when you enroll today!